Today's travel medicine includes not only tourism and business travelers, but also incorporates volunteerism, medical care, migration, ecotourism, and more. Travel Medicine, 4th Edition, reflects all of these changes in the field while keeping you up to date with new vaccines and newly proposed regimens, pre-travel advice and post-travel screening, and all travel-related illnesses . 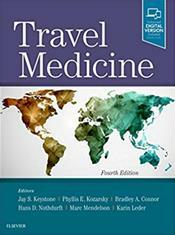 for a one-stop, authoritative reference on all aspects of travel medicine. Includes new chapters to assist your care of specific populations such as those engaging in ecotourism or military travel, as well as the VIP traveler. A new chapter on pre-travel considerations for non-vaccine preventable travel infections has also been added. Provides new information on new influenza and shingles vaccines, microbiome and drug resistance, Zika and the pregnant or breastfeeding traveler, the Viagra effect and increase in STIs, refugees and immigrants, and much more. Covers new methods of prevention of dengue virus, Zika virus, chikungunya virus, Middle Eastern respiratory syndrome, sleeping sickness, and avian flu.